On April 6th 2008 I received a call from S.Liyanagama, Secretary to the Chief Government Whip of Parliament and Secretary to the Ministry of Sports that Jeyaraj Fernandopulle has met with an "accident". He wanted me to switch on they TV. When I inquired from him as to where he was calling from he replied that he was calling from Weliweriya. Everything comes to pass with death except memories of gratitude to some. April 06th marks the 2nd death anniversary of Jeyaraj. I was impressed by his deep thoughts and the seriousness with which he took his duties to humanity. This is unusual for many who are in power today. The facts surrounding his service to the country are astounding. He was a very busy and amazing gentleman. He lived by his conscience. With amazing humility and strong religious convictions and belief in God he made tremendous sacrifices. As so often happens with men of such force and talent, his quest to serve the people and his desire to fulfill the dreams and aspirations of others he had all the time for others and little time for himself. Working long hours he was never tired inspiring those around him and those who come into contact with him as a remarkable and perfect gentleman that any person would like to know. Jeyaraj was born on January 11, 1953 and had his primary and secondary education at Ave Maria Convent and Maris Stella College, Negombo respectively. His legal career commenced in 1977 and together with his innate intelligence, rare combination of linguistic skills and analytical thinking he became well-known for his fearless submissions in Court in defending his clients. He is known as a fearless defender of the rights of humanity in Parliament. 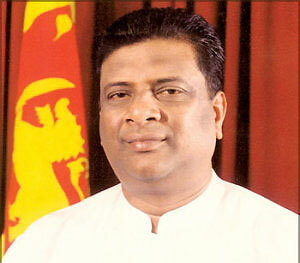 He was elected to Parliament from the Gampaha district in 1989. In 1993, he was elected as a member of the politburo of the Sri Lanka Freedom Party and was elected as the Assistant Secretary of the Party. In 1994, he was elected as a Member of Parliament for the second time and was appointed as the Deputy Minister of Finance, Ethnic Affairs and National Integration the same year. In 1997, he was appointed as the Minister of Plan Implementation and Parliamentary Affairs. In 2000, he was appointed as the Minister of Civil Aviation, Tourism and Christian Religious Affairs. In 2001, he was re-elected as a Member of Parliament for the fourth time. In 2002, he was appointed the Chairman of the Committee of Public Enterprises (COPE) which dealt with the scrutiny of Public Enterprises. In 2002 he was also appointed as a member of the Parliamentary Select Committee appointed to inquire into allegation made against the Chairman of Bribery and Corruption Commission. In 2004, he was appointed as the Minister of Trade, Commere and Consumer Affairs and in addition was appointed to the most important position in Parliament as the Chief Government Whip of Parliament. He has held several Cabinet portfolios in Parliament and is reputed for his spontaneous responses and skilled debating. He has been helping the poor, improving the standard and quality of lives in the villages providing education for the underprivileged children. The quality of Jeyaraj is best known when it is evident that all his efforts were not for political gain because my personal acquaintance with him has proved that he helped anyone and everyone regardless of electoral jurisdictions or of political affiliations. If a politician can get his message across in a three minute interview or on an off-the-record briefing to the journalist - the arguments that he set out had fermenting in his mind bottled up over a period of time and as such the words that flowed were like vintage wine. The crux of his successful oratory was the bond of empathy between him and the audience. The greatest talent a politician can have is the ability to convey sincerity. He has impressively displayed that left over his fieriest critics unable to cast doubt on the strength of his beliefs, his efficiency, capability and oratorical skills which none could match in the present Parliament. Great speeches need not be made by great leaders. Jeyaraj's speeches were spontaneous, on the spur of the moment with chosen thoughts which flowed as words most appropriate for the moment. Every word uttered by him was powerful in its intellectual and moral force. He was an active voice in Parliament. A man who will stop at nothing for justice, fairness and unity. He is fearless, upright and would voice his opinion according to his conscience. He was not only respected by the members of his Party but also the opposition parties for his wit, quick response and debating skills coupled with skills of advocacy. If Negombo is known as Little Rome, then Jeyaraj was the Julius Caesar of Little Rome.